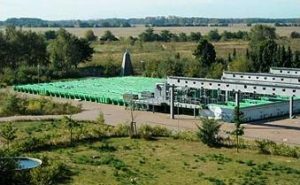 The Artificial Stream and Pond System (FSA) of the Federal Environment Agency (Umweltbundesamt, UBA) in Berlin (www.uba.de/fsa) will offer AQUACOSM Transnational Access (TA) for international scientists to participate in two projects in 2019 (see detailed information below). The general experimental designs are already established and external users are invited to contribute with additional parts to the topics described below (Project 1 and Project 2). Project 1: Suitability and limits of passive samplers for monitoring of contaminant loads in small water bodies (PASTraMi). Project Lead: Stefan Meinecke, May to November 2019. The overall goal of this project is the investigation of the suitability of passive samplers for monitoring contaminants (PSM, REACH chemicals) in small water bodies. Project 1 will be conducted in the outdoor facility in spring 2019, but the precise start will depend on weather conditions. A total of at least 80 person-days will be available to external users for AQUACOSM Transnational Access provision in 2019. 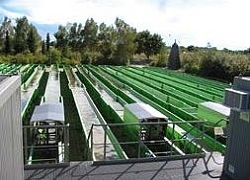 Experiment: The sampling performance of different types of passive samplers with a simulated pollutant contamination (mainly pesticides and REACH chemicals) will be investigated under nature like conditions in three outdoor stream mesocosms of the artificial streams and ponds facility of the Federal Environment Agency (Germany) during the vegetation period in 2019. Therefore, we will set up a pulse scenario within one stream mesocosm or a mixed scenario of pulse and continuous exposure using two stream mesocosms as alternative options. Three stream mesocosms with a flow length of 108 m each (approx. 30 m³ water) are available for the project (Fig. 1). 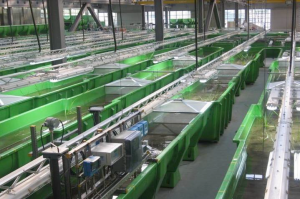 One stream mesocosm (#1) is equipped with sediment and plant and will be used as test system for contaminant exposure. A second mesocosm (equipped comparable to mesocosm #1) is defined as control system (#2). The third mesocosm (#3) is free of sediment, plants and contaminants, and can be used for simulation of rectangular pulses by transferring passive samplers from #1 to #3 and/or vice versa. Besides rectangular pulses there is also the possibility to realize other pulse forms by water exchange in the test stream (#1). Details on substances and experimental setup are still under discussion and any contribution by guest scientists interested to participate via the Aquacosm Transnational Access need to be discussed. comparison of collection rates from biota (e.g. macrophytes) and passive samplers. 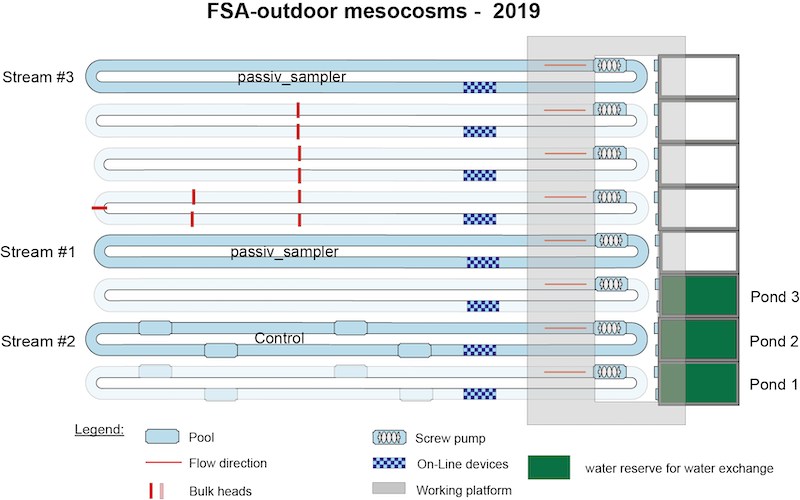 Figure 1: Schematic overview of the planned setup of the PASTraMi project 1 in the outdoor mesocosms of the Artifical Ponds and Streams facility for 2019. Project 2: Degradation of plastics in the shoreline of fresh water bodies. Project Lead: Stefan Meinecke, May to November 2019. The degradation of macroplastics under natural conditions is mechanistically only poorly understood, especially because up to now there is no general established method for measuring degradation rates. We have prepared three stream mesocosms with a stony and sandy shoreline and constant wave exposure. The initial aim a three year lasting project is to find adequate methods and parameters to estimate degradation rate of various plastic materials. Beside optical or image-forming methods for the assessment of surface changes (i.e. standard light microscopes, a scattered light sensor and potentially a white light interferometer, which will be available on site), also material testing methods like tensile tests or comparative electron microscopy of surface structure might be promising for tracking plastic degradation. In addition chemical analyses can be considered in order to detect losses of additives or changes in the polymer structure as a proxy of the degradation rate. Currently, the project aims on three different polymers, but further types and hence also corresponding types of analyses are conceivably and will be supported by the host institute. The Artificial Stream and Pond System (FSA) of the Federal Environment Agency (Umweltbundesamt, UBA) in Berlin (www.uba.de/fsa) will offer AQUACOSM Transnational Access (TA) for international scientists to participate in two different independent projects in 2018. The general experimental design is already established in both cases and external users are invited to contribute with additional parts to the respective topic. Since both projects will be conducted in the outdoor facility the precise start in spring 2018 will depend on weather conditions. A total of at least 200 person-days for 4-8 persons will be allocated to external users for AQUACOSM Transnational Access provision in 2018. The degradation of macroplastics under natural conditions is mechanistically only poorly understood, especially because up to now there is no general established method for measuring degradation rates. We have prepared two stream mesocosms with a stony shoreline and constant wave exposure. The initial aim a three year lasting project is to find adequate methods and parameters to estimate degradation rate of various plastic materials. Beside optical or image-forming methods for the assessment of surface changes (i.e. standard light microscopes, a scattered light sensor and potentially a white light interferometer, which will be available on site), also material testing methods like tensile tests or comparative electron microscopy of surface structure might be promising for tracking plastic degradation. In addition chemical analyses could be considered in order to detect losses of additives or changes in the polymer structure as a proxy of the degradation rate. The latter approaches, especially chemical analyses, are not available on site and need to be an expertise by the guest scientist. Currently, the project aims on three different polymers (PET, PE, PBAT), but further types (e.g. material or shape) and hence also corresponding types of analyses are conceivably and will be supported by the host institute. Metformin is one of the most commonly prescribed antidiabetic pharmaceuticals on the global scale and enters the waste water untransformed as there is no metabolism in human bodies. However, information on its fate in the water phase under natural conditions is scare and known degradation rates are ranging between few and more than 100 days. The project aims to investigate the transformation processes and ecotoxicological effects of Metformin under more natural conditions in two 100-m outdoor stream mesocosm containing a well-developed community including also macrophytes and benthic invertebrates. A special focus of the host institute is on degradation rates and the formation of transformation products under environmentally realistic conditions in the water phase, which will be measured on site. Furthermore, we are highly interested in including transformation processes in other compartments, especially sediment and macrophytes investigated by guest scientists. In addition, effects on bacterial communities or selected invertebrate species as well as bioaccumulation in various taxa would be valuable to add. The host institute can provide further support in terms of for example chemical analyses especially of nutrients, neutral tracers or similar by agreement. 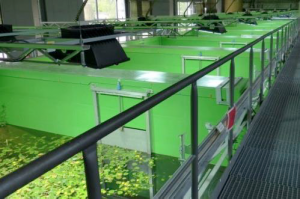 The Artificial Stream and Pond System (FSA) of the German Environment Agency (UBA) is a large and technically sophisticated experimental facility in Berlin (Figs 6.19.1-2). It comprises 8 outdoor and 8 indoor streams (100 m length, water volume of 40 m3 each), 8 outdoor and 8 indoor ponds (water volume of 60 m3 each) and associated equipment. In addition the facility comprises 18 small indoor ponds (water volume of 1 m3 each) and 8 small indoor stream channels (water volume of 2 m3 each). Each stream and pond is equipped with online instruments to continuously measure conductivity, O2, pH, water level, temperature, turbidity and, in streams, flow velocity. Chemical variables such as contaminants in water, sediment and biota can be measured in the laboratory according to demands. FSA is well equipped with gas chromatographs-mass spectrometers (GC-MS), high-performance liquid chromatograph (HPLC), an inorganic carbon (IC) analyser, a TOC analyser, automated titration units, an ion chromatograph, a continuous flow analyser for nutrient analyses (N, P), etc. In addition, light conditions in and above the water of streams and ponds, chlorophyll a and phaeopigments, and many other biological variables are routinely analysed. All experimental data are fed into a central data base for quality checks and analysis. The input of data entry, in particular physico-chemical data, from defined analysis protocols is automated. The database user programme is independent of the system software and is available on the internet. A total of at least 200 person-days for 4-8 persons, will be allocated to external users for AQUACOSM Transnational Access provision in year 2. Users supported by AQUACOSM are invited to contribute particularly to one of two projects: Fragmentation behaviour of plastics under hydraulic stress using saltwater and freshwater mesocsosms, and calibration of passive samplers for monitoring chemical contaminations in small streams. Services currently offered by the infrastructure: The FSA is operated by permanent staff including 3 biologists, 2 engineers, 3 technicians, 1 electrician and 1 craftsman. 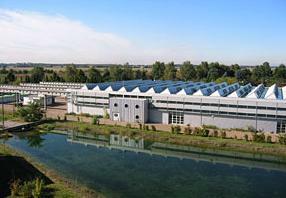 The team oversees the scientific and technical planning and maintenance of the facility. 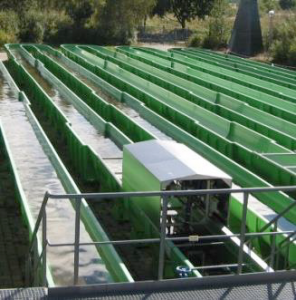 Since its establishment in 2001, >30 projects have been completed, mainly on the fate and effects of chemicals on aquatic organisms under near-natural conditions (see https://www.umweltbundesamt.de/en/topics/chemicals/chemical-research-at-uba/artificial-stream-pond-system).